First, the whole point of performing a stress test on any system is to see whether or not that system is strong enough to withstand potentially dangerous events, so it’s important to stress the system an appropriate amount. But just as important is whether that stress is done in isolation or in combination with other factors. Let’s say you want to model how well your country’s infrastructure can survive the upcoming year’s natural disasters. An uncorrelated stress may involve simulating an earthquake, a flood or tsunami, a pandemic and a massive hurricane all simultaneously. Summary: Lots of bad things happening, but not a very realistic scenario. Uncorrelated stresses can include shocks to just about everything that might possibly happen simultaneously, just to pile things on. But the more things you include, the less likely that actual scenario is. It’s still helpful to see how resilient (or not!) the system might be, but this is more of an extreme situation. I think of this as the Hollywood version – makes for great theatre, but nobody takes it seriously. A correlated stress might start with simulating an earthquake and determining that a small tsunami is likely but there’s no chance for an outbreak or a storm, so the modeling just includes the earthquake and small tsunami. Or it might start with a simulation of a hurricane and determine that a flood might result, followed a month later by water-born illnesses but that the earthquake is unrelated, so it’s not included. Summary: More realistic but it results in a less severe stress. The factors that mainly drive the portfolio are interest rates and prevailing stock prices (say the S&P). We can recalculate the value of the bond given any change in interest rates, and we can estimate the change in value of the stock given any change in the S&P. An uncorrelated stress might start with a huge rise in interest rates and an equally huge drop in the S&P. We’d then recalculate the values of the bond and the stock and we know how the whole portfolio would respond. Depending on how we hold the securities (long or short), it might be worse if the S&P rose and interest rates rose as well. Since we’re doing an uncorrelated stress test, we’re free to make them move any way we want. The corresponding correlated stress might still start with a huge rise in interest rates, but it would then estimate what the S&P would do (because they’re correlated), and then use those as the starting point to re-value the portfolio. Alternatively, we could have started with a huge move in the S&P, and then the interest rate move is estimated (based on its correlation to the S&P) and those two moves are then used to revalue the portfolio. In a correlated stress, we’re not free to dictate both the interest rate move and the S&P move – we’re only free to dictate one or the other. That’s known in the parlance as the “number of degrees of freedom.” In a correlated stress, you have only 1 degree of freedom: the one factor you choose to shock. I’m going to argue that neither of these approaches is the best. The uncorrelated stress is “too hot”: you can make widely unrealistic moves in the factors that have no bearing in reality. Sure, it’s possible that everything bad happens at once but “possible” and “worth worrying about” are two very different things. 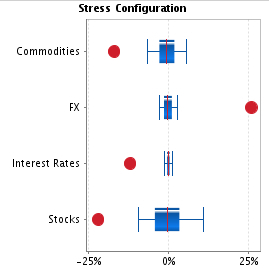 Figure 1: Inputs into an Uncorrelated Stress: I control how each factor moves. Figure 2: Visualization of how the chosen stress compares to the factors' typical behavior. This stress is just "too hot." Figure 2 shows red dots representing the amounts of the specified stress as compared to the blue “typical” range of each factor. For the Stocks, the chosen value of -22% is way outside 1-sigma (blue band) zone and is even way outside the min/max hash-marks. The other factors are similarly all well outside their min/max values. Figure 3: When I run the same stress in 'correlated' mode, the system tells me how the other factors are likely to respond to my chosen shock of S&P down 22%. The system suggests that if stocks are down 22%, that bonds will rise in value by only 0.17%, that the Euro will drop only about 3% and that commodities will be down on about 6%. These are all based on recent correlations, which are “too cold” for my taste — I think more severe things will happen. That’s why we allow folks to override the system’s suggestions. I’m free to make this stress “just right” by using the correlated stress as a starting point, and modifying as I see fit. Those who like to think about behavioral economics might object “wait, you’re subject to the anchoring bias if you use the correlated stress as a starting point” and that’s actually my whole point. I think it’s better to start from that ‘anchored’ point because it’s how markets have been behaving – either recently or in a historical crisis – and that will temper the kinds of stresses people make. I think it’s a reasonable balance between the too hot and the too cold regimes you get otherwise. If we don’t anchor, we’re free to let our wild imaginations run lose and that decreases the probability to ‘not worth worrying about.’ With anchoring (on the correlated stress), we will hopefully not stray too far from the realm of the realistic. Score one for making a proactive use of one of our otherwise debilitating biases.